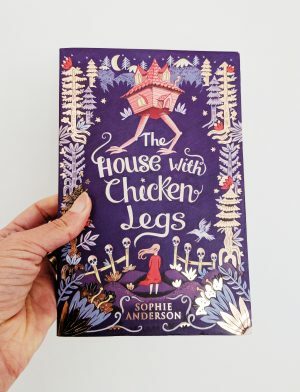 I was intrigued by Baba Yaga as a child so when The House with Chicken Legs came out it went straight onto my TBR pile. Call me shallow but it also captured my attention because of the amazing cover illustration by Melissa Castrillon – a foiled tapestry of trees, skulls and moonlit forests. I couldn’t really remember a specific story arc from the original folktale, more a collection of images. The wandering house with it’s chicken feet of course, the bone fence that surrounds it and the bizarre pestle and mortar that the witch flies around on. I was curious to find out how Sophie Anderson had reworked this grim myth for a middle-grade audience. The book starts off with twelve-year-old Marinka, granddaughter of the Yaga, longing for a normal life instead of the magical one she’s inherited. Her world is confined to the house boundaries as she trains to become the future Guardian of the Gate between the living and the dead. She must obey complicated rules and perform the correct rituals much to her dismay. Although Yaga, the house and her pet jackdaw keep her company, Marinka craves human friendship and an existence without responsibility. The last thing she wants to do is become the next Yaga. So she starts to rebel. After this strong setup, there was slight lull and for a few chapters I wondered where the hook was. However, I was really glad that I persisted because this turned out to be one of the best children’s books I’ve read in a long time. Every element is treated with care – the characters, the world-building, the pacing – and the overall arc is extremely satisfying. The themes are profound too. Acceptance of death lies at the heart of the novel yet the subject is wound so skillfully into the narrative that you hardly notice it. Ditto the treatment of challenging authority and the notion that the grass is greener elsewhere. We accompany Marinka on a journey through different landscapes and situations which force her to examine every facet of her life. Nothing is as easy or predictable as she thinks. Just as in real life, her encounters and realisations are full of twists. Some are happy, some are cruel – there’s often no clear cut solution. At times I was reminded of Howl’s Moving Castle which certainly shares similarities with this story, but The House with Chicken Legs has a world all of its own full of customs, histories and unique individuals. Sophie Anderson spins a completely new cosmos from small seeds. I loved the way that the universe expands so that by the time you turn the last page you feel as if you witnessed a glimpse of something epic. It has slow sections that’s for sure so if you like your plot fast and furious then this won’t be for you, but if you enjoy considered fantasy with heart then this is one to try. And don’t just take my word for it, the book has been nominated for several awards including the CILIP Carnegie Medal 2019 and the Blue Peter Book Awards 2019. I predict that it will take a number of gongs next year and deservedly so. Hopefully this will be the start of a long and enchanting career for Sophie Anderson. Excellent review! This sounds fascinating, and the cover art is amazing – I definitely can see how it captured your interest. It really did stand out as a brilliantly-crafted book – I had to share this one!